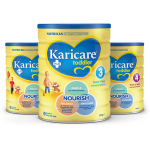 Karicare+ range nutritionally supports mothers and their children from pre-conception to toddlerhood with our range of trusted products, including infant formulas, specialty formulas, toddler milk drinks and multivitamins. Karicare+ Goats' Milk Infant Formula Stage 1: From birth - breast milk substitute Karicare+ Goats' Milk Infant Formula is a premium goats' milk-based formula. This breast milk substitute is specially formulated for formula fed babies from birth or when changing from breast feeding. ..
Karicare+ Toddler Goats' Milk Stage 3 - from 1 year Karicare+ Toddler Goats’ Milk supplement is a delicious milk drink for toddlers one year and older, providing key nutrients for toddlers when nutritional intake is inadequate. Goats’ milk toddler supplements are a safe alternative to cows’ milk-based toddler supplements for toddlers experiencing difficulties with a cows’ milk-based supplement, or for parents who would prefer to use a goats’ milk supplement. ..
Karicare+ Toddler Growing Up MilkStage 4 - from 2 yearsKaricare+ Toddler Growing Up Milk Stage 4 is a milk drink, specially formulated for children aged two and up, whose normal intake of energy and nutrients may not be adequate. ..